I’ve been asked by a few people to do a post about what’s in my bag. I figured I would give it a go, and let you know the contents of my handbag. 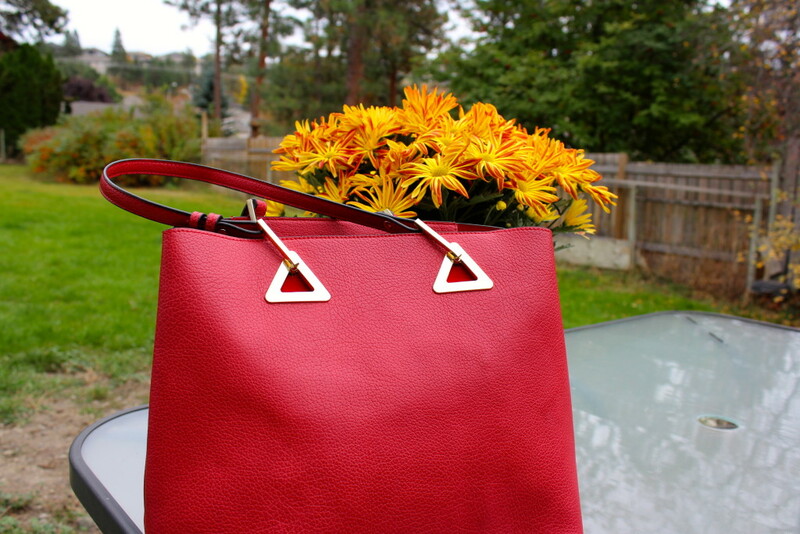 I’m currently using a red handbag I bought in Nova Scotia while I was on holiday at Northern Sun Gallery. Depending on where I’m wearing my bag, and what I’m up to I switch between this bag, my Guess tote bag, and a rucksack from Chapters. I love this red bag because of the gold hardware and the amount of storage. There’s also a shoulder strap if I need it, which I love. Day planner from Chapters – The thing I make sure is in my handbag at all times is my planner. I like this planner because although it’s for 2016 it has the last few months of 2015 in it too. It’s small, but has a lot of room for writing. I need to have it on me at all times for my job, and scheduling meetings, interviews and events. It also comes in handy for writing down blog post ideas. My little makeup bag from Crabtree and Evelyn – This little bag is the perfect spot for my lip products and makeup for touch ups throughout the day. Guess change purse – My wallet doesn’t have an area for coin, so I needed to get a change purse. This fits everything I need, as well it has compartments for cards incase I don’t want to bring my bag with me. Glasses – I need my glasses wherever I go or I would be as blind as a bat! Apple Earphones – You know.. so I can listen to my tunes. Betsey Johnson Wallet – I bought this wallet from Winners a year ago, and I still love it so much. The inside is gold, and has enough space for my cards and cash. An umbrella – Since moving to British Columbia I figured I needed to invest in an umbrella. I got this one from Shoppers for $7. Sunglasses – These are from Forever21, and were about $2. Audio Recorder – Being a journalist I always carry an audio recorder with me because you never know when news will happen!. I got this one as a christmas gift, and love it. Keys – My leather M I bought at the halifax farmers market, and the seashell is from Mahone Bay. Both of these remind me of Nova Scotia and my holiday there. An extra memory card – I usually have my Canon camera with me, so I try to always keep an extra memory card, so I’m never without. I tend to always forget to put the cards back into my camera. Tylenol – Though I rarely use it, I try to carry tylenol on me as much as possible. It’s good in a pitch if I have a headache, or if someone around me does. Blistex – I always have dry lips, so having lip balm at my finger tips is a necessity for me. Pencil case by Kate Spade – Lastly I carry my pencil case filled to the brim with pens and pencils. I usually carry a notebook for work, so having a constant supply of pens is a must. Other things I tend to carry with me are: My Iphone, notebooks, Ipad, Camera, a book, and some water. 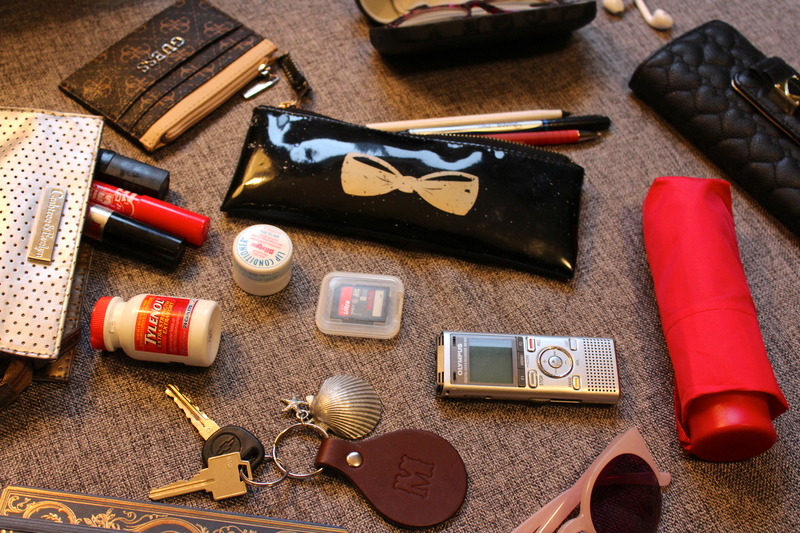 Hopefully you enjoyed this post, and I want to know what you carry in your handbag. Let me know in the comments! I feel you! What’s in my bag videos are some of my fav on youtube! 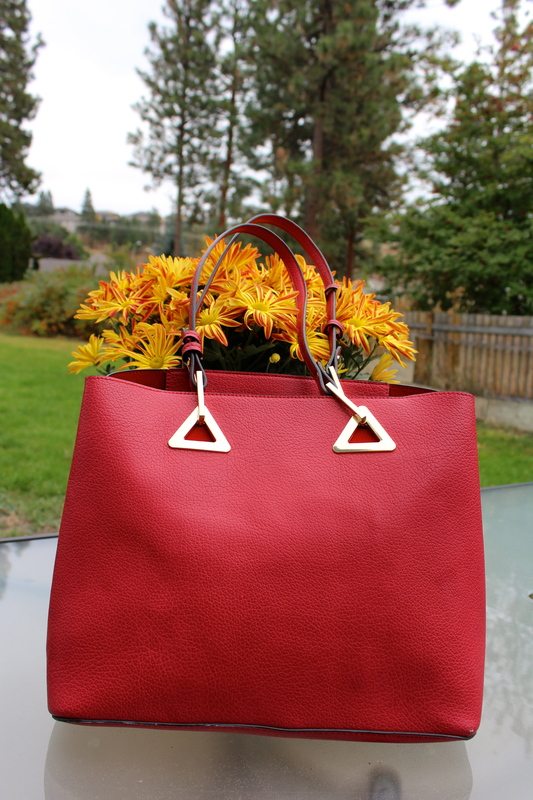 I love your red bag, it’s perfect for fall! I always have my wallet, iPhone and my planner in my bag too and a random assortment of lipsticks and snacks! You have motivated me to clean out my purse. It’s a hot mess. Gum wrappers, broken necklace, and rece0ipts from probably three months ago! I should do a “what’s in my bag” post too! 🙂 I love how clean and organized you are! That bag is so great looking! I usually just carry my phone, wallet and notebook, and a lot of garbage! I don’t know why I find the “what’s in my bag” post so interesting, but I do lol…cute bag too by the way! That’s so cool that you carry a voice recorder around with you. I write so I often just jot things down that I see or think of, but maybe I should invest in a voice recorder to capture exactly what I’m thinking! 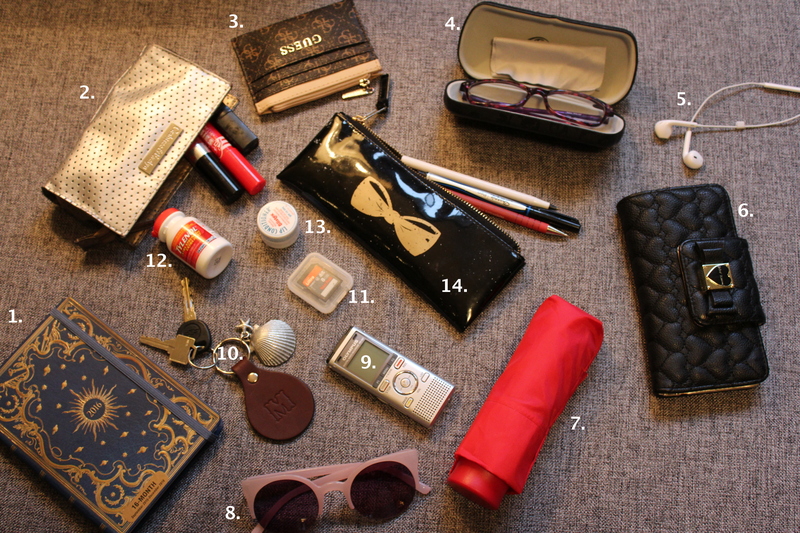 I love the ‘flat lay’ that you’ve done of all the things in your bag, it looks really cool! If you have an Iphone there’s a voice recording feature you can use on it! Love your bag! It’s a great size to carry everything too. I always have a diaper bag with me these days, but I think even when those days are over, I am going to still carry a larger bag so I can have things like an umbrella. Great post! That bag is amazing. I want it! I probably need to invest in a bigger one because I can’t fit everything I need in the little one i have.